“There are many kinds of power, used and unused, acknowledged or otherwise.” This quote comes from an Audre Lorde´s book, published in 1984. (1) It is not exactly a challenge, however, to affirm how up-to-date it is. The reference is from a still current movement inside and outside academia, towards a process of giving visibility to power structures, while, recognizing power from usually denied speeches, discourses, experiences and knowledge production. Moreover, it also speaks a lot about the approach and motivation from which this piece was born. This blog entry is based on the assignment given to use during the Summer School on Degrowth and Environmental Justice from June 25th – July 7th 2017. Instead of looking outside for an issue to target for the assignment, we decided to use this task to look inside the Summer School and to make power asymmetries in this space visible. We came up with this topic while having coffee and cake on the busy Plaza de la Vireeina in Gracia, Barcelona. Behind us lay a highly emotional Toxic Tour through a suburb neighbourhood called Montcada. After the long day, enjoying the extra hours of summertime, we sat in the lively plaza and started talking and sharing our experiences and feelings in an informal way. We realized that if it felt important to share our emotions and how we experienced different parts of the Summer School, and decided it could be meaningful for the group as a whole to share our experiences, dialoguing with the content and debates we were having during those days. To talk about and name power layers is important in all groups and spaces. But it is especially important in groups and spaces that want to bring along change and break with the heteropatriarchal system. The Summer School is such a space. And during the two weeks we spent a lot of time talking about power. But most of the times we talked about the power structures outside of the class room. Capitalism, patriarchy and colonialism are at the centre of the critiques that the Degrowth movement is expressing. In the end, it’s all about power asymmetries. But if we want to not trap into the same problems, e.g. avoid eurocentrism within the movement, it’s not enough to talk about power structures in general. We HAVE to talk about ourselves and reflect our position, for we are all part of the different layers of power that are out there. In fact, there is no inside and outside. The power structures that we witnessed inside of the Summer School are mirroring power layers in wider society. But it is also important to acknowledge, that it is a place where we felt comfortable bringing up this critical topic, whereas in many other groups and spaces in our everyday lives it is quite difficult to address power asymmetries. In other words, we recognized the need of directly addressing these issues and, at the same time, we decided to expose ourselves inside this space. Seeing this potential we will now share some of our personal experiences with you. We chose a feminist approach, highlighting alternatives to current practices and structures. Feminist ontology acknowledges experience as roots for knowledge and as aspect to be observed and analysed. As channels of experiences feminist ontology explores three media – the mind, the body and emotions. Feminist epistemology emphasizes the personal as political. “This argues that power and its use can be examined within personal life and, indeed, in some sense that the political must be examined in this way” (2). Further feminist epistemology recognizes the personal involvement of the researcher in the research, uses reflexivity and refutes objectivity of science. At the same time, different feminist approaches also bring us aspects on asymmetries of power, giving elements to analysis layers on access to speech (Spivak, 2008) and constructing an entire critique to the concept of development from women´s perspectives (Lang, 2014). We are using phenomenological methodology of different experiences in the Summer School for our exploration. Phenomenology highlights how a person experiences and interprets a phenomenon and tries to understand how people construct meaning. Therefore phenomenology allows us to base our investigation in our own experiences and consciously highlights the personal perspective on a topic also prevalent in wider society. We are Leonie from Berlin in Germany, Camila from Rio de Janeiro in Brazil and Karoline from Lüneburg in Germany, all of us with a background and practice on Communication Studies and working with environmental issues from different perspectives and places in the world, but in the three cases with a direct relation to social structures. The first meeting of all the participants and organizers of the Summer School on Degrowth and Environmental Justice. I am excited. Nervous. So many new faces. So much energy. These are the people I will spend the next two weeks together. Learning and exploring Degrowth and meeting exceptional minds and wonderful personalities. In this specific moment there is no noticeable difference between participants and responsible individuals. I am just enjoying the moment. To the end of the introductory event the different positions become more visible. I am realizing who is another participant. I am meeting volunteers. And I am meeting the organiser team. Three powerful women is what I am thinking. During the course of the Summer School the different power structures become more visible. I start understanding who does what. Who has which responsibilities? Who has which status? And I also start questioning it. Why are the organizers of this space three women? Why is it that the big lectures are given by men? Why do I have the feeling that there is more space and respect given when these men are talking? Why are all alternatives to the conventional structures of lecturing in universities lead by women? Why is it that the work of organizing and caring is also here taken up by women? And above all I am wondering why a place like this, so aware of what is problematic for us human beings in society still falls into the same trap of assigning the typical tasks of care and nurturing to women? Re-establishing the dichotomy between men and women? Sunday afternoon, 25th of June, 2016, outskirts of Barcelona. I get off at the station Baixador de Vallvidrera and walked in the direction of the park of Collserola, where I have met the entire group of the Degrowth Summer School. Time was getting slower, I was taking a breath, after a long trip from Rio de Janeiro, in Brazil, to Spain. My body also slowed down, while we started talking about ourselves. 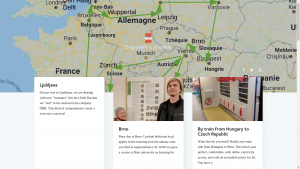 Organizers propose the exercise of a map, starting from where we were born. We were just a few people, about 10% of the class, from countries in the so called South hemisphere. I know this feeling and I start thinking about that when we move to the next exercise, mentioning topics from our works: environmental justice, communication, solidarity economy, agroecology, feminism. In that moment, my mind is still connected with news I received in the days before travelling to Barcelona. More violations of indigenous rights in the North region of Brazil, my recent talks with women comrades in the West Zone of Rio de Janeiro fighting for the right of cultivating their land and food, while they face land speculation, gentrification and other elements. I was very interested in understanding how would we place these and so many other discussions during the Summer School. Our schedule, academic debates and activities start. Nice discussions and very good moments of sharing thoughts with the others, inside and outside the classes. We are debating the development model, the critique on capitalism, looking to alternatives. We are shaping power, but still in a very abstract level. Some questions come to my mind and I start sharing some of them during the classes. One lecture is about guaranteed minimum income. The person giving the lecture is collecting some questions and I ask about the approach of gender/race inside the project. No answer. Another moment, on a debate on ecofeminism, the question is about the connections with the critique on structural racism that comes from feminists in the US, African countries and Latin America. Again, no answer. I had to deal with silence and the same happened with other colleagues that were posing these issues. The expression Third World comes in some moments. I am wondering why people in that room still use this expression. I look back to the academic references that were presented to us as readings for the Summer School, the absolute majority of them European or from North America. Global South (a concept that came from the North) is presented in the context of biggest problems or sometimes of experiences, but usually in the place of objects. I feel tired about some discussions, because I feel no one can discuss about ethnicity, “buen vivir”, livelihoods, agroecology, inequalities, women struggles and, well, about global power structures, without understanding the roots of some concepts, without looking outside Europe and North America. If the debate comes from a perspective that is still Eurocentric, how to go beyond that repeating the same references and models? Is it possible to change the world without breaking these very stablished power structures? For sure, more people were sharing similar questions. Nevertheless, at some point, nice, challenging and deep conversations happened, as the one that started this blog piece here. At first, we tried to place ourselves inside these hierarchies of knowledge, inequalities and oppressions. After that, the debate could go to some other ways. Many more ways, and then it really got interesting. Inside the official program of the school, but also outside. It was not possible anymore to ignore the issue of power in different levels, felt by each person in various ways. Making differences and layers visible we started trying to discuss bridges, for example connecting the North and the South, from the perspective of utopia, but without hiding what has to be addressed. Are there more people impacted by all of this? I do not know. But all of this came home with me. I am walking in a tiny urban part in the outskirts of Barcelona. I am part of a group. Students of the Degrowth Summer School on a Toxic Tour. We are here to experience the negative sides of a city. The pollution, the contamination of the air and water. The destruction of landscape and nature. A pollution for our eyes and ears. After being informed that the local concrete factory is poisoning the local environment, representing a high danger for the people living here, we walk through the streets. Looking at the people and thinking about what we have just heard, experienced and felt. I am taking a look at our group. Young people, students, researchers. All of us well educated, from different nations of the world. All at least bi-lingual and used to travel and live in other countries. All of us from a more or less good background. How do I feel when walking through this space? I am confused! What am I supposed to feel? Pity for the people? For their acquired ignorance for the danger of their situation? The ignorance their daily happiness is dependent on? For their lack of freedom and choice? 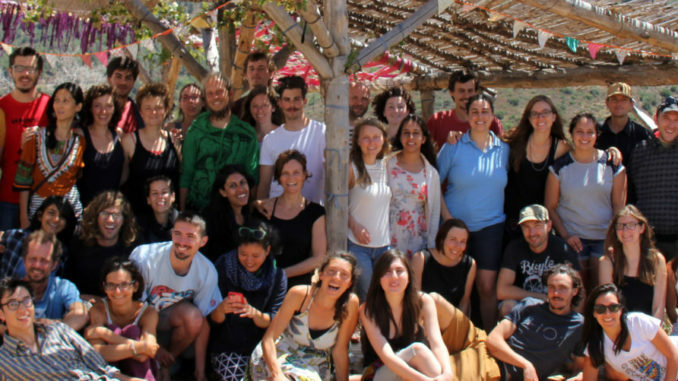 Freedom we, the students of the Degrowth Summer School, have! The people in the street are looking back at us. Seeing a group of young people walking around, looking and judging the space they call home. Judging their life situation. While I am walking I am thinking that no one in our group will live here or in a place like this. And I am wondering why no one living here is part of our group! Shortly after walking through the streets of Montcada, passing the cement factory, that is silently polluting the air of this Barcelonean neighbourhood, we sit down in a circle on a small patch of grass. It is the only green spot that we could find. We are trapped by the railways on one site and a big street on the other. The grass is covered by the bark of some plane trees that are kindly providing shade for the group. Little sounds of cracking are continuously emerging from hands playing around with the pieces of bark. I fumble around with a piece myself. We are having the debriefing of the exercise that Karoline described above. The facilitators want us to focus on our emotions: How did it feel to walk through the streets of Montcada? The first that raises his hand to speak is a white male from the global north. “I don’t have an emotion to share, but I want to say something else…” he starts, and continues to talk about something, that I can’t remember. Other people raise their hands. Some speak from their heart, others put out rather rational thoughts. I try to listen actively and with empathy. A woman from the global south takes the word next. She shares her feeling of desperation: “The situation in the cities of my country is much worse than Montcada’s. I don’t see that anything is changing to the better. I am losing my hope.” Her short speech activates a feeling within myself that I knew of but never listened to openly. All of the sudden I feel and therefore know that a part of me has also lost hope. This part is doubting, that all our thoughts and actions can bring about change. It is very, very scared. And lost. I feel tears filling up my eyes. But instead of showing the strong emotion that is coming up from below my body, I am suddenly busy asking myself: Should I really be crying in this circle, in front of people that I barely know? I don’t feel comfortable to show my tears, so I try to hold them back. I look down onto the grass so that no one can see my face. The emotion slowly loosens its tight grip on me and after five minutes I look up again, join the group with my attention. After another pair of minutes, I even raise my hand to give a contribution. But I dont mention my desperation, nor my tears. Instead, I share the feeling that I had during the exercise. But compared to the recent desperation, the unease that I felt during the exercise was rather superficial, not as important. Later that day I wondered – and I am still wondering – what would have happened if I had shown my tears? I feel that I am still not allowing myself to fall into the hopelessness of that moment because I am scared of losing the incentive to act. When closing the circle, one of the facilitators thanked the woman from the global south for sharing her desperation: “Hopelessness is very important. It is a resource for new strength”, she said. I remember that I did not believe these words. I am not sure if going into desperation will bring us further. But something deep inside tells me nonetheless that this is the way, we should take. And we should walk together, for it will take more courage than I can raise on my own. On the last day of the Summer School we briefly shared these experiences with the group and we asked the other participants to think of situations during the time spent together where they could witness power asymmetries. The feedback we got emphasizes a very important lesson to learn when talking about power structures: you can only speak from your own position and you might not see or realize some layers of power that are omnipresent to other people. One layer that we didn’t pay much attention to within our assignment-group was language. But it turned out to be a topic to many of the other participants. “If you are not perfect with the language I felt it is more difficult to get the attention of others”, one participant commented. Many agreed on this. A full list of all the responses we received after our presentation can be found in the end of the blog. After the brief sharing of experiences we felt a bit sorry that we didn’t talk about this earlier. So this is something we want to advice to the participants of the Summer School in 2018: be sensitive to power asymmetries and make them a topic. Talk about how you feel in this space! Lorde, A. (1984). “Sister Outsider: Essays and Speeches by Audre Lorde”. The Crossing Press: San Francisco. Stanley, L. W., S. (1993). Breaking Out Again: feminist ontology & epistemology (2 ed.). London: Routledge. Spivak, G. (2008). Can the subaltern speak? In: Colonial Discourse and Post-Colonial Theory. Williams, P. and Chrisman, L.(eds). Columbia University Press: New York. Lang, M et al. (2014). Critiques and alternatives to development: A feminist perspective. In: Beyond Development: Alternative visions from Latin America. Transnational Institute and Rosa Luxemburg Foundation.